Detroit is once again facing a budget emergency, as Mayor Dave Bing and Chief Financial Officer Jack Martin say the city could run out of cash in seven days. A recent flap over the consent agreement between the city and the state has the Michigan Treasury set to withhold revenue-sharing payments for Detroit and allow debtors to collect on bonds that are keeping the city afloat. If that happens, Detroit officials say the city could run out of cash by next Friday. “If our city runs out of money there is no bigger crisis facing our city,” Bing told reporters Friday morning. According to MLive, Martin said the city would likely make payroll June 15, but would then find itself operating on a deficit for the remainder of the fiscal year, which ends June 30. An unbalanced city budget would violate the terms of Detroit’s consent agreement, and could trigger the imposition of an emergency manager. Avoiding a state takeover in the form of an emergency manager pushed Bing and city council to approve the consent agreement in April, but its that same document that’s at the center of the revenue-sharing fight. Krystal Crittendon, the city’s corporation counsel, alleges the consent agreement is invalid and is pursuing her case in Ingham County Circuit Court. Crittendon’s job is to enforce the new city charter, and she says the charter prohibits the city from making contracts with parties that owe it money. 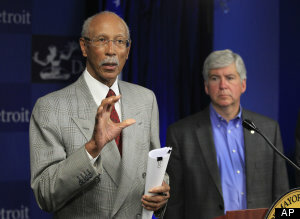 She claims Michigan owes Detroit more than $200 million. “I informed her the lawsuit is a distraction and would put the city’s finances at great risk,” the mayor said in a Friday statement.Bing does not support Crittendon’s challenge, but city council members have taken a wait-and-see approach, saying they have little interest in violating the charter. Bing said he would abide by a court decision, but urged Crittendon to drop her case.